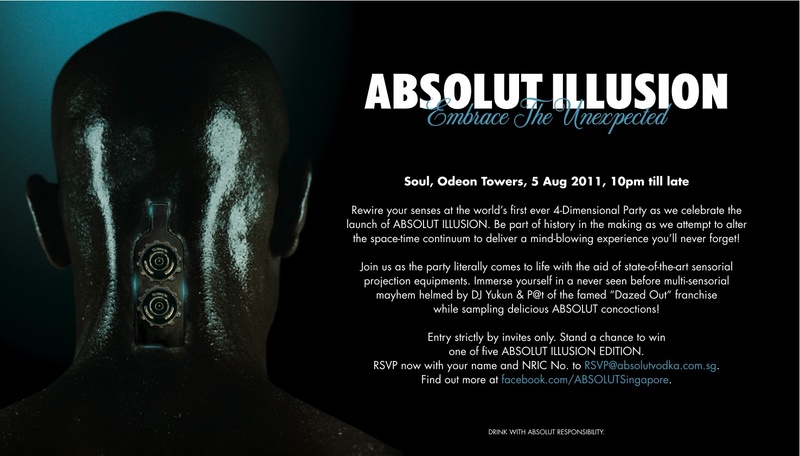 Get set to party at Singapore's first ever 4-dimensional extravaganza brought to you by none other than ABSOLUT Vodka. From 10pm til late on 5th August, expect state-of-the-art visual projections and aural mayhem courtesy of the dynamic duo of dance music, DJ Yukun and P@T of the famed "PROGRESSIONS franchise! 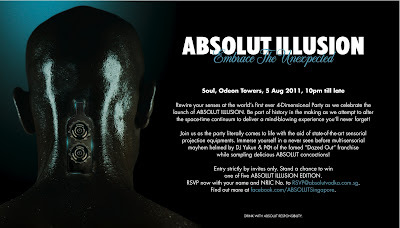 So come & get your mind blown away as ABSOLUT alters the space-time continuum for one night only at Soul. Entry is strictly by invite only. RSVP now with your name and NRIC number to RSVP@absolutvodka.com.sg and stand a chance to win 1 of 5 limited edition ABSOLUT ILLUSION bottles.